PLEASE NOTE: The Baader T-2 90-deg Mirror Diagonal consists of a diagonal body with mirror only. It is provided as a basic component, without any nosepiece or eyepiece holder. It incorporates standard T-2 (M42x0.75) threads at the input (female T thread on the telescope side) and output (male T thread on the eyepiece side) faces. This permits the diagonal to be used as a compatible component along with the other Baader Planetarium T-2 adapters and accessories. Baader Planetarium's new Broadband Hardcoated Silver (BBHS) T-2 mirror diagonal # 24561035 brings silver into the 21st Century. Silver has always been a superior coating to aluminum coatings (even 'enhanced' aluminum) due to its higher reflectivity across the visual spectrum. However, until now, even overcoated silver mirrors exhibited inferior durability to aluminum. Baader's new proprietary hard dielectric coating process seals and protects the silver layer to give durability the equal of aluminum. Baader's BBHS dielectric coatings deliver high reflectivity across a wider visual spectrum, resulting in improved color contrasts when compared to aluminum and all-dielectric mirrors. The silver coatings also deliver noticeably less scatter than all-dielectrics, resulting in improved contrast that rivals a top quality prism. Like all the Baader Planetarium products, the mechanical quality and finish are superb. The precision machined aluminum housing provides a stress-free mounting and precise location for the mirror, unlike the typical weak plastic or crudely cast housings found on lesser diagonals. Modular T-2 System Design: The design of the T-2 Mirror Diagonal enables it to be configured to exactly suit your needs. The input and output T-2 threads integrate with the full range of Baader Astro T-2 System components and other T threaded adapters. 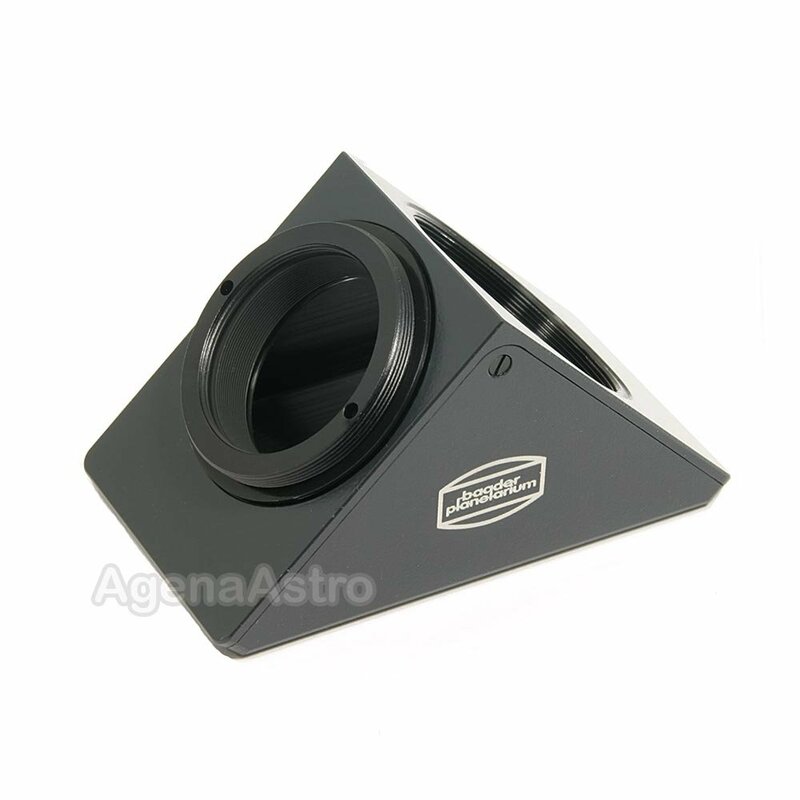 The telescope side can hence be configured to fit in 2" or 1.25" focusers, as well as directly on telescopes with specific threads such as original M44 Zeiss threads, Vixen OTAs or Russian Maks. The eyepiece side can be used with Baader's quick change ring #6 in order to mount the Mark V binocular viewer instead of an eyepiece (in order to achieve the shortest possible backfocus distance between telescope and binocular viewer) or alternatively mount 1.25" (not 2") eyepiece holders. Not just a visual accessory, this diagonal also integrates well into digital imaging applications. I bought this diagonal specifically to observe the ancient stars of globular and some open clusters. These stars put out most of their light beyond visible wavelengths where dielectric coatings have no reflectivity. It has met my expectations easily and I highly recommend it. I wanted the short path length of the T-2 version but there is a 2 inch also offered by Baader for those that need it. As always with Baader products, this diagonal is solidly built and performs as expected.